Meg's Boutique: OOTD- Where the hell is Wally? When you're a student finding fancy dress outfits is almost as important as finding regular outfits and it's always good to find them on a budget (particularly as you'll probably only end up wearing them once or twice!). With this in mind I thought I'd show you what I wore last Monday night. It was our first Guys and Dolls clubbing social and as I'm one of the social secretaries for Sheffield University Performing Arts Society (I'll call it SUPAS from now on...) it was down to me to choose a theme. I instantly went for 'where's wally?' as I thought it was easy, fun, not too daunting for the freshers and could easily be done for a budget...and I was right as everyone loved the theme and I only spent a grand total of £2 on my costume- bargain! 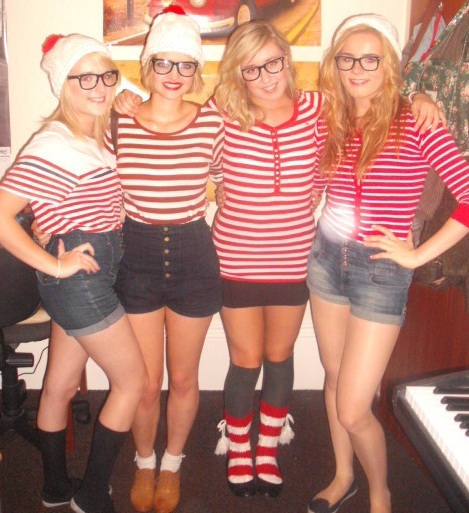 You probably know by now that I'm the one second from the left with the blonde bob...but how gorgeous do my girls look even dressed as wallys! Anyway I basically I wanted to save lots of money by using things I already had, so I wore my high waisted navy Topshop shorts, white Primark ankle socks and ASDA brogues on my bottom half. The blue shorts were in keeping with the theme and defined my figure and I thought the ankle sock and brogue combination gave the outfit a cutsie look. I also already had the glasses, because I bought them to dress up as a geek last year and they've turned out to be a very good investment. TOP TIP- If you ever need cheap chunky black framed glasses to be a school girl, geek or wally, then just pop the lenses out of cinema 3D glasses, lots of people did it for the social and it worked a treat. I was actually lacking the main ingredient- a red and white stripey top, but after scouring the whole of Sheffield high street in search of a cheap one and only finding a £20 one in Topshop, I decided just to ask my friends and the first person I asked happened to have one. So if in doubt just ask around and someone is bound to have what you want! I fancied adding a few extra wallyish touches, so I painted my nails alternately with Rimmel's I love lasting finish in 030 double decker red and natural collection's nail tip whitener. 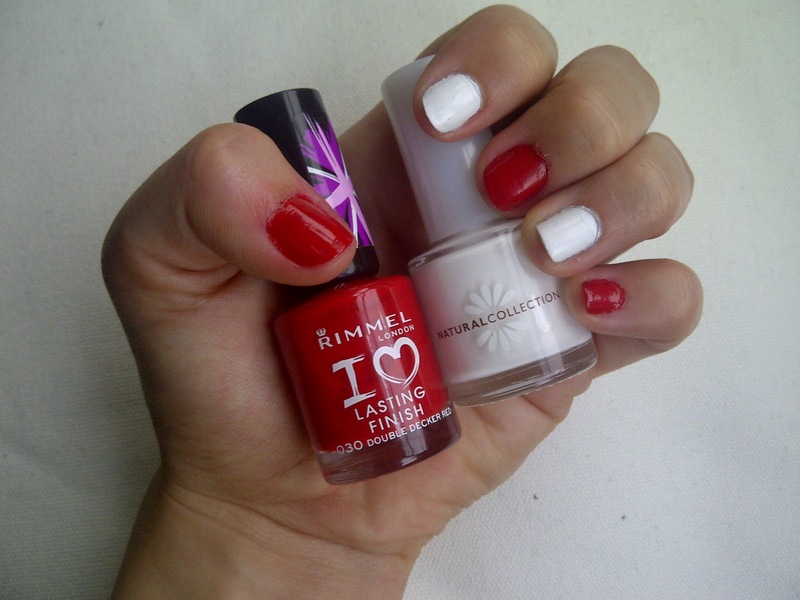 I thought it looked pretty effective and on a side note, both these nail polishes are super cheap and really good quality for what you pay. 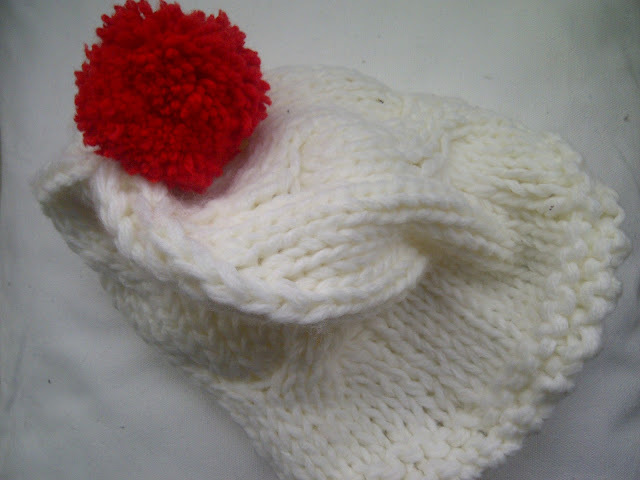 Me and my friends, Emily and Cath, also really wanted where's wally bobble hats so we bought £2 Primark white chunky knit hats (which are an absolute steal as I would definitely wear them in the Winter) and then made red pom poms and sowed them on top. 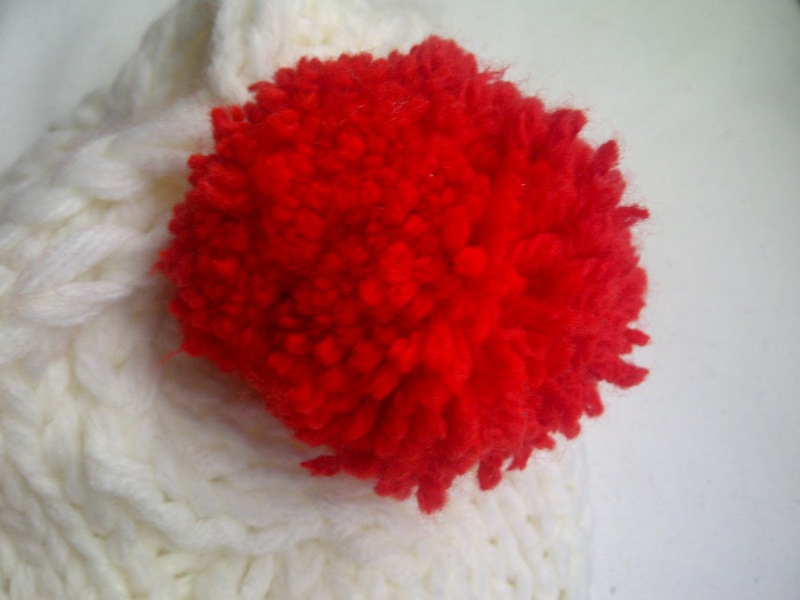 It's very easy to make pom poms, I can still remember how to do it from my Brownie days and I'd be happy to do a post on it if anyone wants to know how to make them. Can you see what we were trying to do here? Will, who is on the end, wrapped black tape around his yellow top to be the bad guy, Nick wore his dressing gown to be the wizard (lol) and Josh wrapped white tape around his red top and fashioned a hat out of boxers wrapped in white tape (another lol) to be the dog. 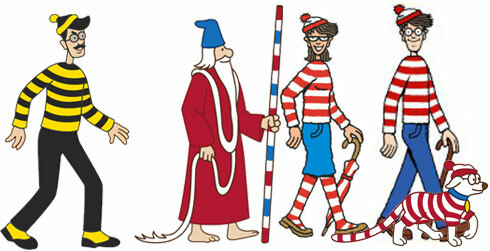 Have you ever dressed up for a where's wally themed event? Or have you managed to create some other good budget fancy dress costumes? Hope you have a fabulous night! haha this made me laugh so much, this looks like an amazing night! Haha great post, your outfit was so cute with the socks and brogues! Angie- aww thank you, that's so sweet! and I love the Meg's Missing idea hahaha Yes defo get the natural collection one, it's so cheap! cool post haha! I totally fall for your awesome shorts. Your make-up looks very nice too.